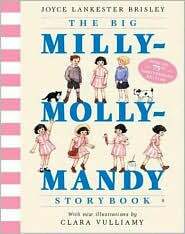 Several years ago, I stumbled across the book, The Big Milly Molly Mandy Storybook written by Joyce Lankester Brisley. First written in 1928, it is being reprinted so new generations of readers can be introduced to this delightful little girl. Milly-Molly-Mandy (short for Millicent Margaret Amanda) finds joy in serving and helping others. You will meet and come to love her family and friends in these pages. Her efforts don't always go according to plan but that adds some "giggle moments" to the story that will surely entertain young audiences. It's a wonderful family read-aloud but I have often caught my older kids re-reading it themselves. And don't assume that only little girls will like the stories; my boys were just as enthralled as my girls! The 75th Anniversary Edition published by Kingfisher (available used through Barnes and Noble) includes 9 adventures in the life of Milly-Molly-Mandy. Her first escapade involves running errands for her parents, aunt & uncle and grandparents. Some of the later stories detail her experiences gardening, tending a shop for a friend, visiting the sea, "sledging" and carol-singing. There are a variety of reprinted editons also available through Amazon. Chelle, the owner of the blog, Last in Line... has a marvelous lapbook that coordinate with this book. Pages within her download include the book characters to color, a map of the town, cards for a matching activity, copywork and narration sheets as well as several scenes from the book to color. Pick and choose from the activities or assemble the coloring pages into a folder for your own customized coloring book. This is a wonderful way to keep younger ones occupied while you read the storybook aloud. I hope you will take the time to meet Milly-Molly-Mandy. If you are a parent, grandparent, or teacher, you can introduce the children in your life to this wonderful little girl living a fun and care-free childhood without the need for Facebook, e-mail, TV or video games! Just the beautiful innocence of family and village life. I'd love to hear what you think of her--please come back and leave a comment. Just popping back to say thanks for the link to the MMM extras they are exactly what I was looking for. I love Milly-Molly-Mandy! I didn't "know" her until Sonlight started carrying the storybook a few years ago. The stories are SO cute! Thanks Jill for the lapbook mention - and just had to pop a comment here saying we just love Milly-Molly-Mandy. used to read these book growing up in Barbados. will be getting them for my son. or myself. I loved these books as a child and I just got excited when I found them. Mechelle, Thanks for stopping by--that's neat that you enjoyed MMM as a child and can now share them with your son!